The original Pig Hotel located in Brockenhurst in the heart of the New Forest provided the template for the brands later additions. One of which is Bert’s Box, which opened its doors less than a year ago. The box was designed and fitted with products from the Bert and May brand, which gives it the unique and high-end finish. Bert’s Box is a large suite which can be used as a self-catering option as it has a large full kitchen and a farmhouse dining table which seats six. If you’re looking to have your own sanctuary, this suite is a great option as it has a large private garden. The garden faces off into the forest so horses, wildlife, and beautiful countryside is literally just a few millimeters from the garden fence. The box has been carefully and cleverly designed to make the most of the wonderful views. All the rooms facing the garden have floor-to-ceiling windows so you can enjoy the views from every room in the suite. The exception being the wet room, where as you would expect, your modesty is protected. 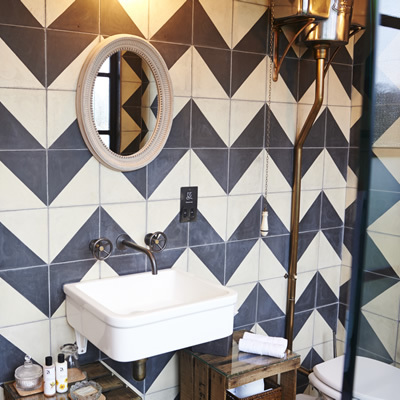 The wet room is a very chic affair, with regal black and white tiling and industrial taps. 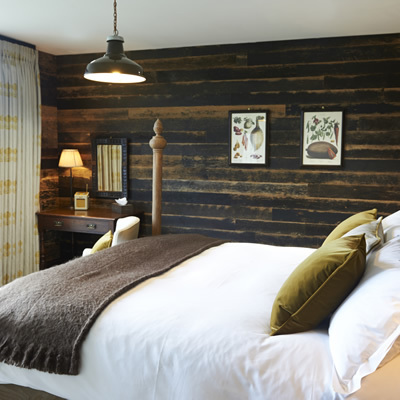 The bedroom has a rural chic look, with rustic wood paneling and a large wooden-framed bed. The living area follows the same theme, it feels like inspiration has been taken from the hotel’s surroundings and injected with the utmost of taste. This space has comfy armchairs and a large moss green footstool which stole the show for me. 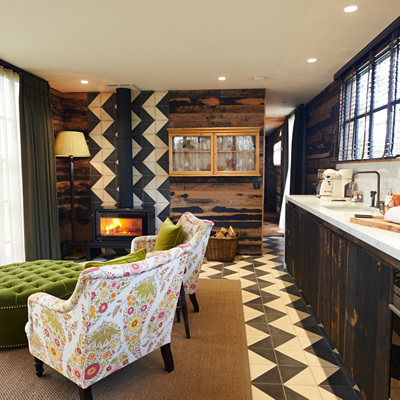 The chairs sit in front of a log burner, and the hotel supplies a large basket of wood so guests are kept snug in the winter months. The suite also has a cinema room where a gorgeous Chesterfield sofa can be found opposite a huge flat screen TV which provides an enjoyable space to relax. 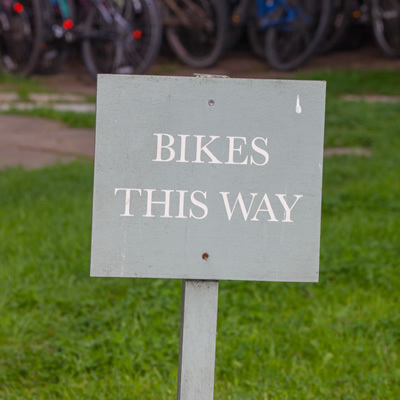 As a self-catering suite, the hotel provides free range eggs and homemade bread along with some condiments like herb-infused olive oil so you can cook your own breakfast. A welcome touch, and provides an option for those not wanting to visit the hotel’s restaurant. The hotel also has some wonderful grounds which are worth exploring. 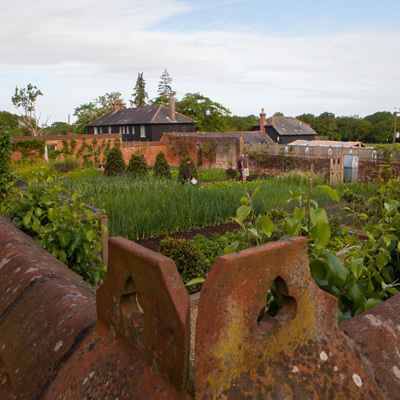 They have a herb garden, which is where the hotel sources much of their fresh herbs and vegetables used in their restaurant, and they also have an array of animals, such as chickens, quails, sheep, and of course as the name suggests, resident pigs. Inside the main hotel building there are several lounges and rooms where you can enjoy a pre-dinner drink, and as previously mentioned they have a restaurant which is a must visit. 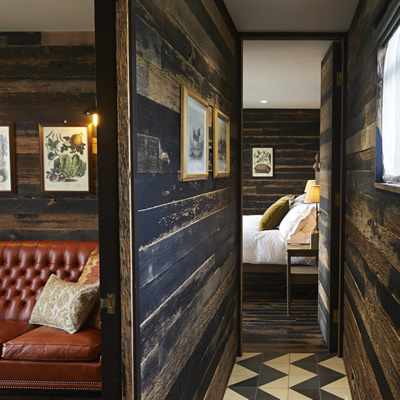 Staying at The Pig and experiencing Bert’s Box provides a seductive blend of seclusion and shabby chic which is simply a must experience.